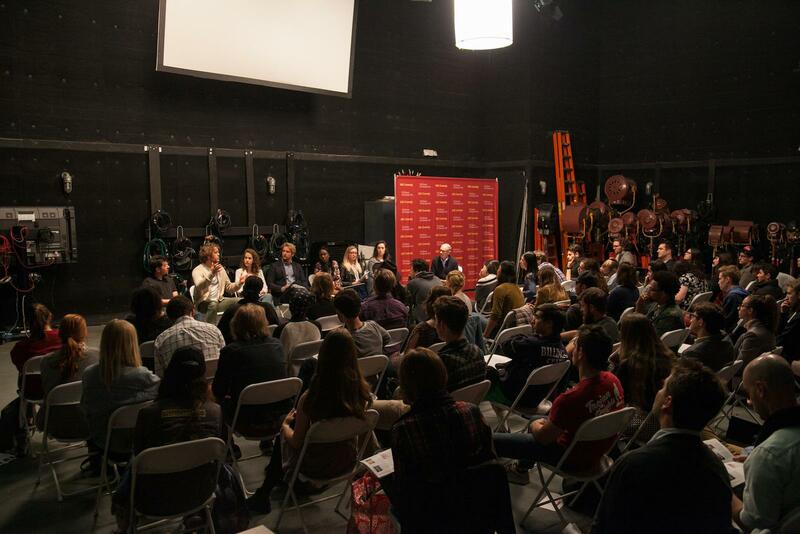 One of the many perks that come with being a USC School of Cinematic Arts student are the frequent visits from alumni who are among the biggest names in entertainment. Luminaries like Ryan Coogler, Shonda Rhimes, Paul Feig, or even George Lucas—to name just a few—are always sure to excite a crowd of students. But such rare examples of success, many of whom graduated twenty or thirty years ago, sometimes fail to paint an accurate picture of the industry students will enter today. For that, the best advice will likely come from alumni who just five years ago were in the same position as students today, and who know what it takes to succeed in today’s industry because they’re actively doing just that. 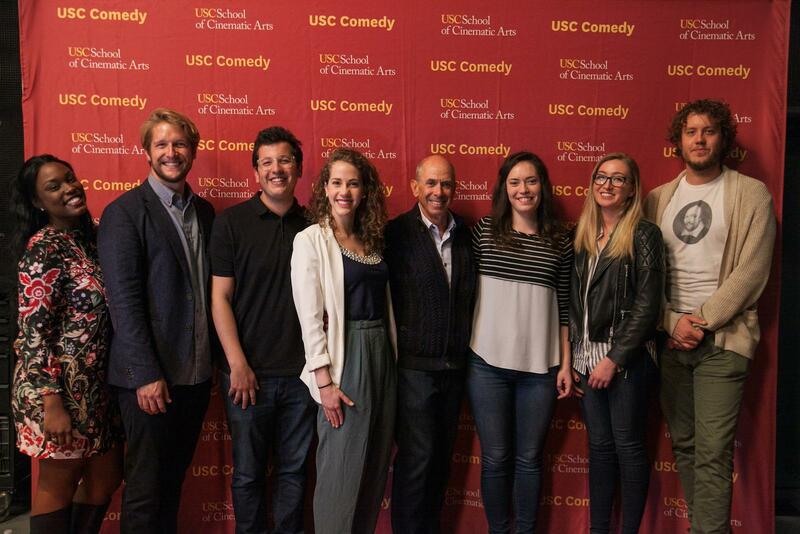 This is what USC Comedy Co-Founder and SCA Professor Barnet Kellman had in mind when organizing USC Comedy’s Young Alumni Mixer, Vol. 2. The event, held last Monday, April 3, welcomed back to campus six SCA alumni— Michael Lewen ’12, Kerry Furrh ’14, Angela Beevers ’12, Madison Ainley ’11, Thembi Banks ’14, Allison Tate-Cortese ’15, Jack Henry Robbins ’11—to speak to a group of about thirty students about how they made it from SCA student to working professionals. Family—Trojan family, that is—has unsurprisingly played an important role in the careers of all six of the night’s guests. After finishing her spec script, Thembi Banks heard about Women in Film from a classmate working there, who encouraged her to submit her pilot. She was ultimately named a finalist, landing her on multiple “Writers to Watch” lists and opening the doors that led to a staff writing gig on VH1’s Daytime Divas. A fellow alum helped Madison Ainley land an internship at Appian Way, which led to him working as Ben Affleck’s personal assistant for the past four years—and now as a producer on Affleck's most recent directorial film, Live By Night. Kerry Furrh developed a show with a friend at SCA and, after shopping it around for a bit, decided to shoot it as a short film. The short, Girl Band, premiered at Tribeca Film Festival, and they are now adapting it into an hour-long network series. The “what do I want to do with my life?” can often be a difficult and complicated question to answer. By changing the question to the present tense—“What do I enjoy doing with my life?”—the path forward can be a little clearer. And even though the traditional path into the industry is as arduous as ever, for today’s young filmmakers, with the ubiquity of various digital media platforms (from Here Media to YouTube to Buzzfeed) and the accessibility of equipment (4k resolution iPhone cameras, to start), it’s never been a better time to try forging an entirely new one.